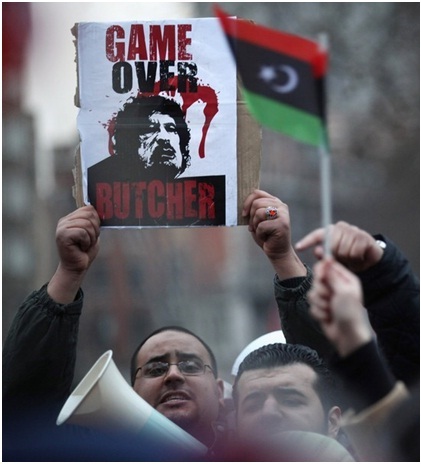 In this week's North African Dispatches, Kateb Salim looks at the awe-inspiring Libyan uprising and the crumbling, disappearing reign of Colonel Gaddafi. Who would have thought it? Several months ago, in an earlier column of mine on the foreseeable succession of Muamar Gaddafi. I attempted to describe and analyze differences between his two sons vying for power, hoping to rule over oil-rich Libya. Fortunately enough recent events in the region, with the downfall of two neighbouring tyrants, have rendered my analysis irrelevant. It will be the people of Libya who will decide of their future, a future which will certainly not include the ‘Colonel’ or any of his family members. 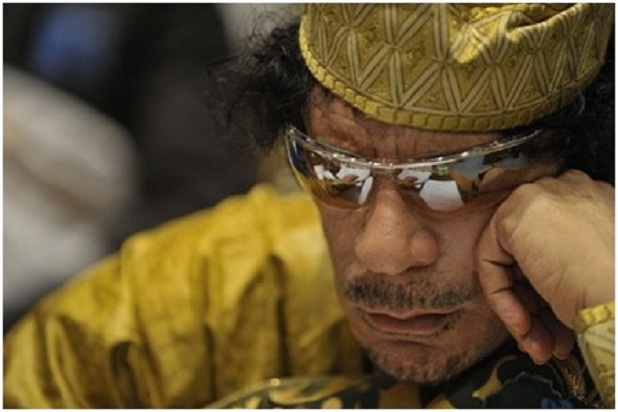 After Ben Ali and Mubarak, the historic collapse of Gaddafi and his regime is now before us. It is the unavoidable outcome of forty two years of an eccentric and despotic reign. It comes after eight days of popular uprisings throughout Libya. Benghazi, the country’s second city led the charge and was amongst the first of many cities to fall to the hands of protestors. Eight days into the revolt, Libyans count their dead by the hundreds with many more unaccounted for due to lack of information. With communications down and international media forbidden from covering the ongoing tragedy, information has primarily trickled out of Libya in the form of rumors and amateur recordings. The videos and images that have made it out tell us that a massacre is taking place against a helpless population. Conducted by a military intervening without restraint or ethical conduct, the repression in Libya is of an unprecedented viciousness. True to himself, Gaddafi looked to thugs south of his border to handle his own dirty business. African mercenaries flocked to Libya as advertisements in Nigeria and Chad promised 2000$ daily for those capable of helping the ‘King of Kings’ remain King. ‘We have escaped hell, a real nightmare’: such was the account of French doctor Gerard Buffet who managed to escape the bloodbath. He and his team of doctors, in an interview with LePoint, described that they had witnessed mass aerial bombings, the use of anti-aircraft weaponry and even mortars being used against masses of protestors in the city of Benghazi. Several other firsthand sources speak of helicopters, hovering at low altitudes, opening fire on unarmed crowds. These methods of repression, of an unmatched brutality, come at a time where the regime is crumbling at a speedy pace. As the protests gained in traction and force around the country, the justice and security ministers, alongside countless members of the diplomatic corps resigned. Other key figures of the regime have continued to do so in objection to the blind violence currently taking place. The defection of the interior minister is perhaps the most notable of these and the biggest blow to the Gaddafi regime. A figurehead of Gaddafi’s regime and a founding member of the free officers’ movement, he represents the closest circle of those the colonel trusts. As that circle continued to shrink so too did that of his support in the armed forces. Earlier this week, two Libyan air force pilots defected and landed in Malta refusing to carry out orders to bomb their own countrymen and women. Meanwhile, the country’s borders have also been laid bare as customs officers abandoned their posts to join protesters. In an unsettling and surreal hour-long speech aired last night, Gaddafi seemed to be declaring war on his own people whom he referred to as ‘greasy rats’ or even ‘cockroaches’. His mannerisms were those of a cornered man. He shouted and banged on his podium to an empty hall, without the crowds he once coerced into cheering at his every word. Vowing to continue his fight to the end and to die a martyr, he spared no words for the fallen or their families, and promised to ‘cleanse’ the nation house by house. Worrying words to say the least. Finally, in line with his usual narcissism and cult of personality, he endlessly glorified himself and refused to step down arguing that he held no position other than ‘guide’ of the revolution. Gaddafi seems to blame everyone from Islamic groups to western meddling to a bunch of ‘stoned’ teenagers in his analysis. As the previous examples in Tunisia and Egypt show us, in the face of such disdain, his theories are fooling nobody. In comparison, Ben Ali and Mubarak almost appear dignified statesmen. France or the United Kingdom who only yesterday praised the Libyan leader, now seem appalled by his behavior, deploring the loss of innocent life. Benefiting from its thriving oil industry Libya had become in recent years an important arms importer. Needless to say that with Gaddafi’s repenting ways, all of these major European powers and their military-industrial complexes lined up at the entrance of his tent in the hope of the ‘Guide’ going on a shopping spree. Today we observe the direct consequences of these careless policies. Anti-aircraft weaponry in the hands of a ruthless dictator is aimed at innocent civilians to thwart a peaceful political revolution. Libya is not an exception but an extreme instance of the region’s tragic state of affairs. Time and time again, we have come to observe these leaders who consider their nations and people as nothing more than their property. Property they are more than happy to leave burning should they be threatened. In the meanwhile, Western powers, partly responsible for the aiding and arming of these autocrats, are left repenting and finger pointing, fearing the emergence of new regimes hostile to their interests. Even so, amidst all of these complex and overarching geo-political realities we must continue to ask ourselves this most basic of questions: How many more people in Libya and elsewhere have to die before these forms of tyranny are brought to an end? You say “It will be the people of Libya who will decide of their future”. I hope you will not come back in a few months to tell us that unfortunately you had it wrong! As you rightly wrote it, many (but not all in my opinion) western states are fearing the emergence of hostile regimes. The worried ones are already working on preventing this possibility, and the less worried ones have probably had a hand in some if not all of these revolts and are just monitoring their plans’ executions. Thank you for this article. It is, unfortunately, very accurate that Gaddafi (and family/cronies) have been treating Libya as their personal property – a fruitful source of oil and cash to fuel their extravagant lifestyle, which they are gripping on to, having little regard (to say the least) to the consequences this has on the country they dare call their own. As regards to your closing question, I don’t know what everybody is waiting for – this is a genocide, it disgusts me that economic interests are being weighed up against the price of Libyan blood. Well written. Your last sentence rings like a deep quest of hope to see all tyrannic regimes all around the world specially within the arab world leaving the power without damages and hearing the desesperate calls of their peoples to do so. we were all happy and excited after the jasmin revolution and the collaps of the pharaon in egypyt ,we are now chocked by all the atrocities committed in Libya..our ultimate hope is certainly to see all the dictators out but what will be the real price and what are the consequences not only for the Arab world but the whole world?? ?